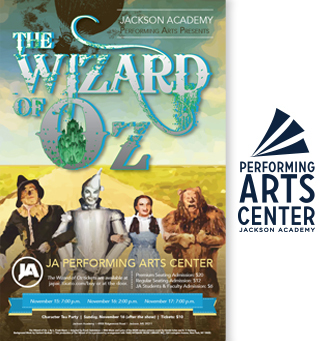 Join Dorothy, Scarecrow, Tin Man, and the Cowardly Lion on their journey down the Yellow Brick Road, in Jackson Academy’s adaptation of Frank L. Baum’s classic tale, The Wizard of Oz! Enjoy tremendous talent, beautiful costuming, and an amazing technical experience on November 15 at 7:00 p.m., November 16 at 2:00 p.m., and November 17 at 7:00 p.m. This production of The Wizard of Oz is produced by arrangement with TAMS-WITMARK MUSIC LIBRARY, INC., 560 Lexington Avenue, New York, NY 10022.